Disclaimer: This post includes affiliate links that I may get compensation from if you decide to make a purchase. Thank you for the support! Join the Crochet Winter Festival!!!! Are you ready to start our PARTY?? It’s time for the Crochet Winter Festival!! Beatrice Ryan Designs and ELK Studio are joining together starting today with a Very Special, Crochet Filled, Prize Giveaway Extravaganza!! We are so excited to see all of the fabulous crochet projects you have been working on… Come back often to see what has been posted daily by all of you!! Scroll down to read all the details of how you can participate and win on of the 4 prizes! What exactly does that mean? Imagine taking your lovely crochet items and entering them in a fair for all to see… and a chance to win a prize! We thought it would be fun to sort of do an “on-line” Winter Crochet Festival where people can enter their latest projects, and you can do it all from the comfort of your home. Of course, there are prizes to win! You can read more about the details below. Let’s talk about the Prizes! Kathy and I are both Red Heart Joy Creators, and we are so happy to announce that Red Heart Yarns will be sponsoring the grand prize! It a $75 prize pack! It would be so awesome if you could jump over to their Facebook page and tell them thank you!! I love working with Red Heart Yarns! We will also award a 1st, 2nd and 3rd prize winner! The rules are simple and easy, so let’s get started. Entries will be received from December 1st until the submission deadline of December 14th, 11:59 pm CST. Voting will begin on December 15th at 12:05 am CST until December 23rd at 11:55 pm. Once voting begins, it will be one vote per person per ISP. Enter a project only once. 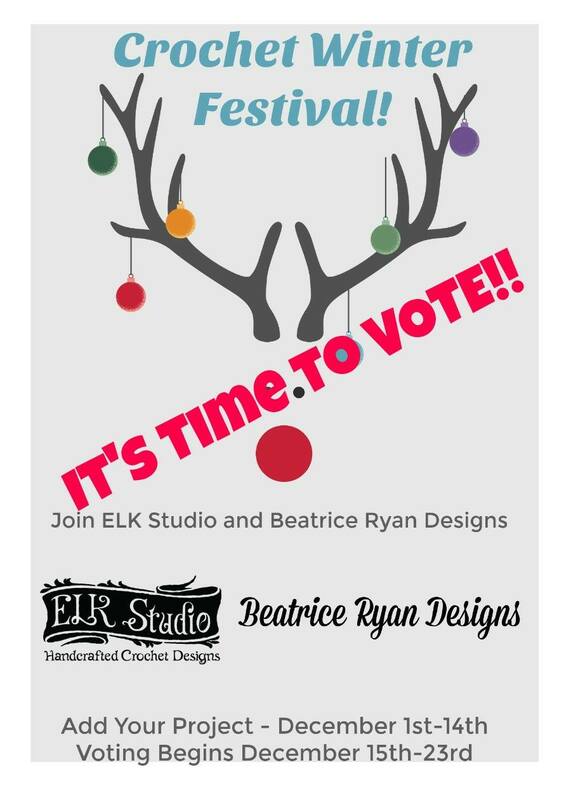 You may enter on the ELK Studio or Beatrice Ryan Designs site. All entries are shown on both sites. You do NOT need a link to add your photo. That’s optional. All projects and photos must be your own. Using a designer’s pattern is acceptable. Don’t forget to use the name of your project or post in the description. Don’t use your name. All winners will be notified via email. A valid email address is necessary for notification. The winner will have 72 hours to respond to the email notifying that you won, otherwise forfeiting the entry. Following ELK Studio and Beatrice Ryan Designs on at least one social media site would be wonderful. All entries are in RANDOM order. If you have any problems loading your photo,,, Shoot me and email to [email protected] and I will help you make it happen… Let’s see how many awesome crocheters can strut their stuff!! Like I said… I can’t wait to see all the fabulous projects… So let’s get the party started!! Make sure you stop by my social media sites for more crochet fun!! Pinterest! Come Pin with me!! Visit Beatrice Ryan Designs's profile on Pinterest. Join Beatrice Ryan Designs on Facebook! Join Beatrice Ryan Designs on Twitter! Amazing Grace Angel Wing Shawl... Free Crochet Pattern! Thick & Quick Bumpy Scrubby ~ Free Crochet Pattern!! Coffee and Cream Poncho... Free Crochet Pattern! Scrap Busting Scrapghan Crochet Along! 2019 Crochet With Me!! Mystery Afghan CAL... Material list! 2019 Crochet with Me!! Mystery Afghan Crochet Along... Week 12!!! Final Week and time for Grand Prize Entry! *My site contains affiliate links and I will be compensated if you make a purchase after clicking on one of the links.